Normandy Life: Mosaic Monday # 23. Talking to horses. Mosaic Monday # 23. Talking to horses. Thanks for all the interesting comments on last week's Mosaic Monday post. It seems that many of us gravitate to the great outdoors with our cameras. Sallie said " We are always drawn to the water.... rivers, marshes, lakes, oceans....and my pictures ( the keepers and the ones I delete) reflect that." Pat had this to say "I seem to take a lot of deer photos and mountain photos now that I live in Colorado. When I lived in NYC it was photos of buildings and the skyline." Linda combined both in the Shenandoah National Park, "Skyline Drive where I go frequently. Often I see deer there,". As I made my way around visiting your blogs I noticed many of us are also interested in wildlife as a favourite subject to photograph. I saw some wonderful captures of wild birds enticed to feeders and bird tables at this time of year. The up side of photographing birds in the garden is that it's possible to do it whilst still staying warm and cosy indoors. I must say I was impressed by the clean windowpanes, not sure I'd get the same high quality captures through mine. It has been well documented on this blog that one of my favourite subjects to photograph are cows, seriously! And yes, I do know that they don't come into the "wildlife" category! Each year from the beginning of March to the very end of October the three fields which surround the Presbytere are home to small herds of Normandie heifers. Seeing them through my bedroom window in the morning always starts my day off well. Whilst out walking M'selle Fleur we often stop to chat with this group of horses and donkeys, they're usually very happy to pose for the camera if we feed them some of the long grass from the roadside. On Saturday we took a different route and met this horse and donkey duo just hanging out together. They seemed like they were good pals. Hello Maggie. Here I am, off to bed whilst you are probably just beginning your day in Normandy. 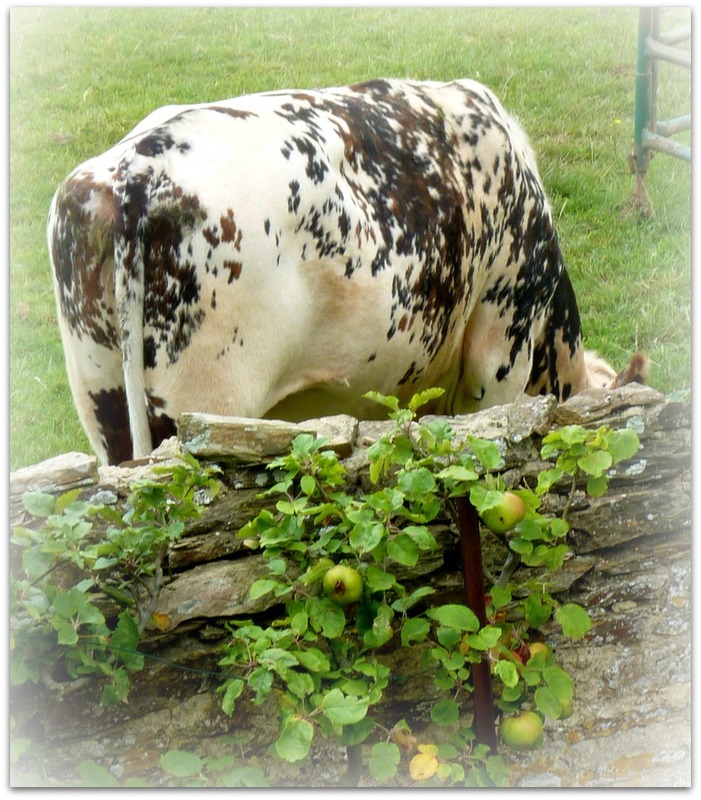 The Normandy cows we saw on our trip last summer were very photogenic, I thought, and our tour guide told us that they are the happiest cows in the world which is why they give such good butter and cream! Your horses and donkeys look very friendly. Wouldn't you like to know what they say back to you? Have a wonderful week. Thanks for hosting MM. Thank you for mentioning my answer as to what i like to photograph. I should have also added historical sites. I love learning history. I don't see many cows where I live but I do see horses and our community has an equestrian center. I hope that some day my granddaughter will take riding lessons there. Your horse and burro look hopeful that you had a snack for them! Smile. Landscape or any inanimate object seem to be images I take most. They just don't screw me up. I wish I was better with animals and people too. When I was a little girl we always had 1-2 cows, they had pretty names and we children walked them on a leash :) Nowadays I see cows seldom but there are horses near by. Wonderful photos Maggie - wishing you a lovely week. No wildlife in my post this week, but it is outdoors! Lovely to see your wildlife - and not so wild! - photos. It is interesting how so many of us like to photograph these things isn't it. Thank you for hosting! thanks most sincerely for hosting me today ! I so love horses and I hope to have soon some of them here, we've so much land here at Tenuta Geremia .. we haven't horses yet because we don't know if we have the time which is necessary to devote to them ... well, let's say that this is a dream of mine ! 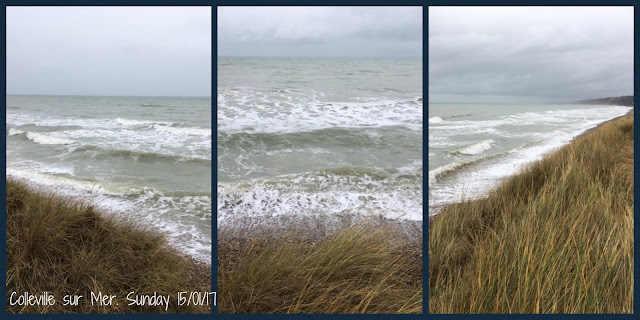 Maggie,your wild sea collage is beautiful - and fortunately you had your camera in hand. My best experiences of wild sea are usually when I'm not distracted by taking photos - or minding dogs! The land looks asleep,just waiting for new growth to burst through. The animals will be waiting for this too! Lovely shot of the horse and donkey. Happy Mosaic Monday - have a great week! Especially love the horse and donkey together! (Why can't we all just be friends? ). Beautiful countryside around your home ...animals make for an interesting walk (and great photo ops). Thank you for hosting and for your always interesting posts. How lovely to visit and chat with the horses and donkey on your walk. We love walking, but not so much in the really cold winter weather, and seeing all the wildlife along the way. I've never seen a spotted cow like that! The ones I see here are more solid-blotchy (or all brown, not nearly as pretty!). And the horses are beautiful. What a lovely day in France you share! When I was a young mom we often walked over to a close by field with horses and fed them grass through the fence. Good memory. Thank you for sharing your wonderful photos and thank you Maggie for Mosaic Monday 23, very much appreciated. Beautiful post, Maggie. I'm without a mosaic this week. "-( Working on getting that fixed. Thanks for hosting this lovely gathering. I always enjoy it! Hello Maggie, you live in a beautiful part of the world and your photos do it justice. Hi Maggie, your header looks like lovely spring to me! Bright and cheerful. And I'd look at cow photos any time. How nice to see them out your windows. Thanks for posting. Such wonderful view of the 'mer'!! I hope to see our sea, this year... I miss the sound of the waves and to look in the sand after some beautiful white shells, too. I enjoyed so much your lovely pictures; and the horses and donkeys are really cute, indeed! Nature is amazing, for sure! Many thanks for sharing them with us! A very lovely week to you! Nothing wrong with cows! But I do love horses! Wonderful photos and collages - such fun subjects. I stop for donkey and horse photos whenever I can.